Every time you recharge your lithium-ion batteries, their storage capacity decreases just a little bit. That is why your mobile gadgets won't stay on nearly as long as they did even a year ago. But thanks to research by the US Department of Energy, we finally know why exactly that occurs and, more importantly, how to stop it from happening. As Lithium-ion batteries discharge, the lithium ions (Li+) carry an electrical charge from the anode to the cathode across a non-aqueous electrolyte. This is what powers your phone. It is not a perfectly repeatable system though, and each time the lithium ions move through the battery, they cause minute changes to the electrodes' physical structures. This is what eventually kills your battery's capacity. Two recent studies published by the journal, Nature Communications, by teams at national DoE labs—including Lawrence Berkeley, Brookhaven, SLAC and the National Renewable Energy Laboratory—have peered intensely into this process and have made some surprising discoveries. "We discovered surprising and never-before-seen evolution and degradation patterns in two key battery materials," Huolin Xin, a materials scientist at Brookhaven Lab's Center for Functional Nanomaterials (CFN) and co-author on both studies, said in a press release. "Contrary to large-scale observation, the lithium-ion reactions actually erode the materials non-uniformly, seizing upon intrinsic vulnerabilities in atomic structure in the same way that rust creeps unevenly across steel." As Li+ ions move across the nickel-oxide anode when discharging, it causes minute breaks in the material, diminishing its capacity. "Consider the way snowflakes only form around tiny particles or bits of dirt in the air," Xin explains. "Without an irregularity to glom onto, the crystals cannot take shape. Our nickel oxide anode only transforms into metallic nickel through nanoscale inhomogeneities or defects in the surface structure, a bit like chinks in the anode's armor." On the other hand, as lithium ions move across the cathode when charging they generate a kind of rock-salt that forms an electrically-insulating crust, also reducing its capacity. "As the lithium ions race through the reaction layers, they cause clumping crystallization—a kind of rock-salt matrix builds up over time and begins limiting performance," Xin said. "We found that these structures tended to form along the lithium-ion reaction channels, which we directly visualized under the TEM [transmission electron microscope - ed]. The effect was even more pronounced at higher voltages, explaining the more rapid deterioration." So now that we know how these batteries are slowly breaking down over the course of their operational lives, researchers should be able to leverage the data into new and more robust battery designs. 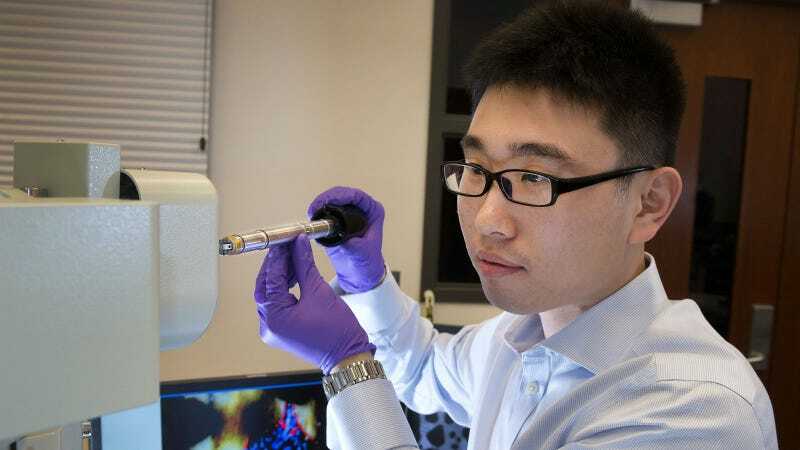 "It may be possible to use atomic deposition to coat the NMC cathodes with elements that resist crystallization, creating nanoscale boundaries within the micron-sized powders needed at the cutting-edge of industry," Xin said. "In fact, Berkeley Lab battery experts Marca Doeff and Feng Lin are working on that now."